I've been waiting a long time to be able to mention this here but it's finally finished and up on FindingBrokeback. I'm not sure if this ever would have happened if you original Tremblayans hadn't first done your interview in 2006, because I'm not sure that we would have even considered him approachable, but I was very fortunate to have met Pierre last summer on my second trip to Alberta and there is an extensive new interview with him now available. Thank you to all of you who had a part in the first one; thanks for leading the way on this! Lauren, I can't wait to read this! You can unsticky it yourself by clicking on the "sticky" button at the bottom of the page, it toggles the sticky/unsticky feature. But I think it would be great to sticky it for a while, it's big news! Ha! Is that the Mexican town set in the background? Hilarious! I think it should be stickied too, but I didn't mean for it to appear in front of the 2006 interview. Maybe in a little while it could be moved down under the first one. The text under the picture of the cast needs to be changed to say "Jim Bond and Tamarack." I didn't do it by myself, and Jim sure didn't need me there in order to do it! That was a gift!! What a wonderful, wonderful interview. This is what I had hoped for in the orginal DVD--and never found. Thank you, Pierre Tremblay, and thank you, tamarack. Again, a heartfelt thank you! This is just absolutely awesome and fascinating. Thanks so, so much for posting this. All the photos and info about the deleted scenes and aspects of production are just the kind of thing I've been so curious about regarding BBM for so long! What an absolutely wonderful, informative, totally great interview - a fantastic mix of background commentary, anecdotes and filming tidbits, and details on every aspect of how this beautiful movie came into being. I read it with elation. And I loved the images. The last one of the cast and crew up on Brokeback - with Jack and Ennis Jake and Heath side by side with one of the dogs - what a lovely picture!! And aaargh! Why oh why isn't there a special DVD or a proper book on the making of the film that contains this kind of info? 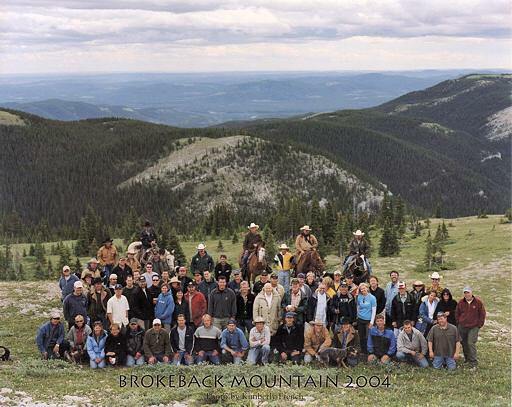 The last one of the cast and crew up on Brokeback - with Jack and Ennis Jake and Heath side by side with one of the dogs - what a lovely picture!! I love that picture as well. Gorgeous, and the dog is fantastic! Wow......OMG....I have just read the entire interviews and am completely overwhelmed. I knew you'd love this as much as we did! There is just so much information here that we haven't had from any other source. The Making of Brokeback Mountain! What a great idea! Y'all ought to check out all the interviews at Finding Brokeback. That site's no little thing! What a stunner of an interview, Lauren and Jim! Thank you so much for gifting us with it. You kept mum about it when we were up there, too, you rascals! Or maybe I just didn't listen in on the right conversations. This is a perfect continuation of our original interview--so much more depth and detail. It will be wonderful to have all these facts in front of us when questions arise about the different scenes. And it blew me away to finally see a picture of Pierre Tremblay! Thank you for this. It's, well, magical. The interview and pic's renew those feelings I had when the film was still in the theaters. As many of you know, one major side effect of BBM for me personally is that I've become a bull-riding enthusiast (something that never would have crossed my mind prior to BBM). So, I just have to say that this pic just makes me so happy! 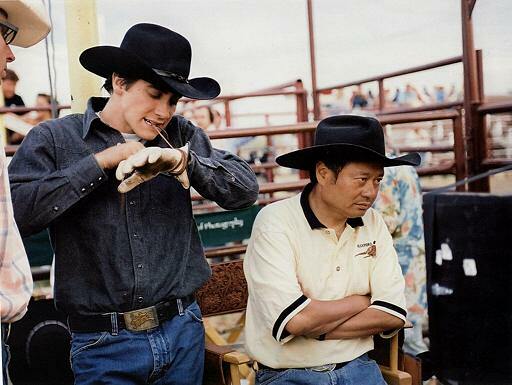 When I watch bull-riding events I often pick the guys to cheer for based on how much they remind me of Jack Twist (probably no big surprise as a Brokie) and this is just the type of image I have in mind a lot of the time while watching real-life events on TV. I'm afraid there wasn't any conversation, Meryl. The only person I ever mentioned this to was MaineWriter when we happened to get together one day, way after the fact, and we talked a little about Alberta. And she was sworn to secrecy! Thank you, Jim Bond and Tamarack. Of course, a DVD with a director's commentary and deleted scenes and other incredible extra features would be awesome, too. What Fran said. But I sure look forward to a Michael Hausman interview in partickeler. Duly noted, Clarissa. I'll see if there's anything we can do. Why the partickeler interest in M.H.? Based on what I keep hearing about him, especially from Pierre Tremblay. The list of movies he's worked on. The fact that he teaches at Columbia, and is supposed to be extremely knowledgeable, generous with the knowledge, fair, passionate about quality, and frankly, probably one of the older people involved. But he's not the only one - all of em! Including Scott Ferguson, who apparently Michael Hausman handpicked out of a class he taught at Columbia and Scott was a student. Here's a list of people I've wanted to know more about and from (it's me copying the cast and crew list from IMDb, and then deleting the ones I haven't realized are also fascinating). I know Finding Brokeback has already interviewed some of them, and supermuchas gracias for that! Here's a list of people I've wanted to know more about and from (it's me copying the cast and crew list from IMDb, and then deleting the ones I haven't realized are also fascinating). Marit Allen (September 17, 1941 – November 26, 2007) was an English fashion journalist and costume designer who specialized in costumes for films. She designed the costumes for several successful Hollywood films, including Mrs. Doubtfire, Eyes Wide Shut, Dirty Rotten Scoundrels, Brokeback Mountain and La Vie en Rose (nominated posthumously for an Oscar, and won BAFTA and César Awards). 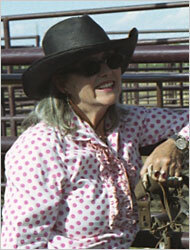 Her career as a film costume designer last over 33 years. "Marit Allen, a British fashion writer and editor in the miniskirted 1960s who went on to design costumes for film characters as varied as the frumpy cross-dresser in “Mrs. 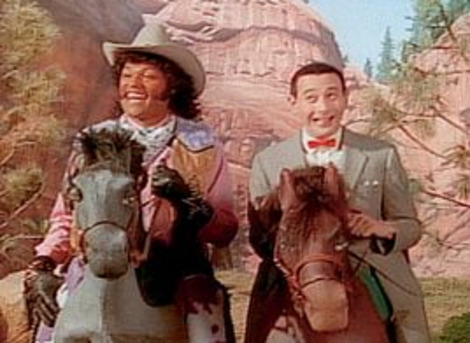 Doubtfire,” the cowboys of Brokeback Mountain and the purple stretch-panted creature in “Hulk,” died on Nov. 26 in Australia. She was 66 and lived in London. The cause was complications of a brain aneurysm, which Ms. Allen suffered while working on a film, her agent, Sara Pritchard, said. With a flair for style that ranged from flowery period piece to sultry gown to slim-fit western wear, Ms. Allen designed costumes for 41 films in as many years. This year her work was seen in “La Vie en Rose,” the biopic of Édith Piaf, and in “Love in the Time of Cholera,” based on Gabriel García Márquez’s novel about a man’s enduring passion for a woman from the late 1800s into the 1930s. Not all of Ms. Allen’s costuming was ornate. In 1973 she worked on Nicholas Roeg’s “Don’t Look Now,” in which Julie Christie and Donald Sutherland portrayed a couple haunted by the spirit of their recently drowned daughter. Last week Mr. Roeg told the online version of The Telegraph of London that Mr. Sutherland found his character only after Ms. Allen provided him with a large pair of woolly gloves, which he wore throughout the shoot. 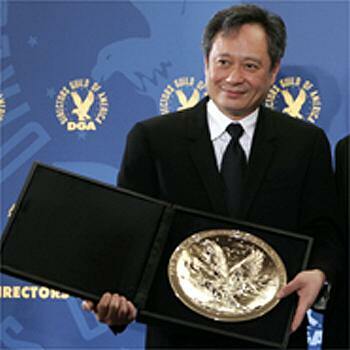 While preparing for Brokeback Mountain Ms. Allen and the film’s director, Ang Lee, studied Richard Avedon’s photographs of the American West. Two of the snap-front shirts that she tailored for the movie’s ill-starred lovers — one a muted plaid, the other denim — sold on eBay last year for a total of $101,100. " Sad, yes. I hope someone is seriously thinking about making this book ("The Making of Brokeback Mountain") happen soon so the principal players can be interviewed now. May I agree with you ! The Daily Telegraph has published an obituary of British costume designer Marit Allen who died on November 26. 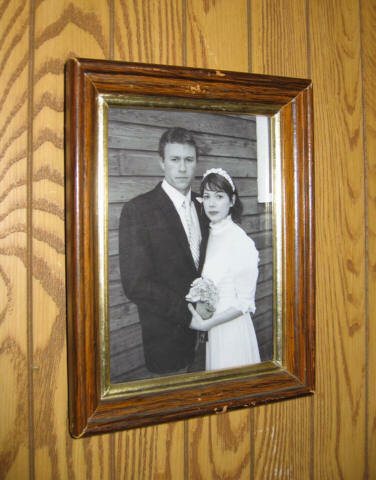 Among other projects, Marit was the designer of the iconic wardrobes of Ennis Del Mar and Jack Twist. 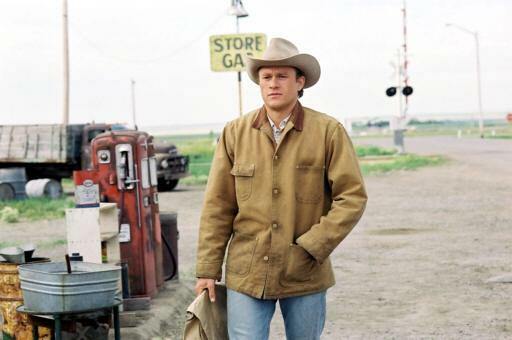 It's difficult to imagine how the clothes worn by Jack and Ennis in Brokeback Mountain could have been more evocative of time, place or character, or how any actor could have used the clothing - especially the hats - with any more feeling for their characters' questions and struggles than Jake Gyllenhaal and Heath Ledger. I have to admit, though I've got Finding Brokeback bookmarked, it's not something I've ever investigated in any great depth, but after reading that interview and having a look round there I can see I've got a lot of reading to do - I'll cancel everything else for the next 6 months! "No matter how hard you try, You're still in prison, If ya born with wings and you never fly." That's what happened to me too, a few months ago. They have worked really hard and there is a bounty of info over there. I know that the more organized types who went on the Alberta Pilgrimage used Finding Brokeback as a main source of guidance. Wow. That's all I have to say. Wow. What an incredible interview! Thank you so much, Lauren!! "It would count as one of the best films in the history of American cinema. At its heart it is a romantic tragedy, but it explores a situation that has never been addressed before. So whether it won Best Picture, or not, does not really matter. In the end, it is—will always be—an important and unique film, a story superbly told." "This may be the peak [of my career]. And if that proves to be the case, I accept that, because Brokeback Mountain will be very difficult to top. Not just because of the material, although it is a rare thing when you have the opportunity to work on a film that is so important, of such quality, a great story, and with a team of gifted professionals." You're very welcome, Lee! Did you just notice that this interview existed? What a huge amount of information he gave us. Yes, I was under the mistaken impression that the interview was the original one, but this one is so much more detailed!! 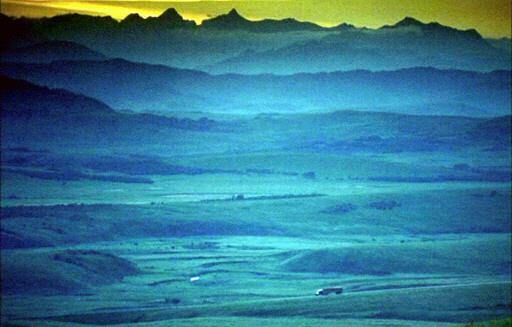 I would love to see you in Denver and/or Wyoming and take you to some of my favourite hangouts. However, I will be in Canmore early June for the BBQ and plan to spend July 4 onward for as long as I can get away with it in Wyoming. In August, I plan to go to Scotland. Also, there's a shindig in San Francisco in July that I hope to attend. Well, I won't be in AB in June again, and I doubt that I'll ever be in Scotland, sadly, but Wyoming or Denver will do nicely! 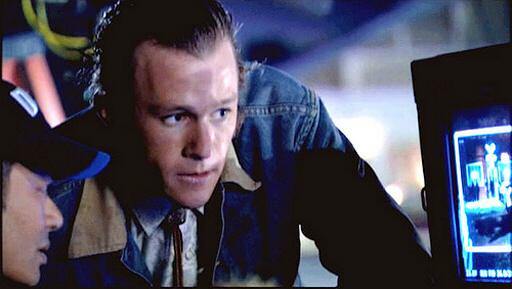 I was just revisiting this thread in preparation for the upcoming day honoring Heath... looking for interesting Heath/Ennis images. And, I wanted to just comment again about how wonderful I think this thread is. Phenomenal. I'll pass your comments on to my colleagues. We totally agree with you that the information we received was phenomenal. Yesterday, I spent some lovely hours over at findingbrokeback.com . I do this from time to time, check out what's new or reread some stuff. And I always marvel at the pictures and even more at the dedication of the findingbrokeback-team. They're doing a terrific job! Their site is such an incredible source of information. As always, a big thank you to them . And I love watching the section with pictures of Brokies visiting various filming locations. So precious.